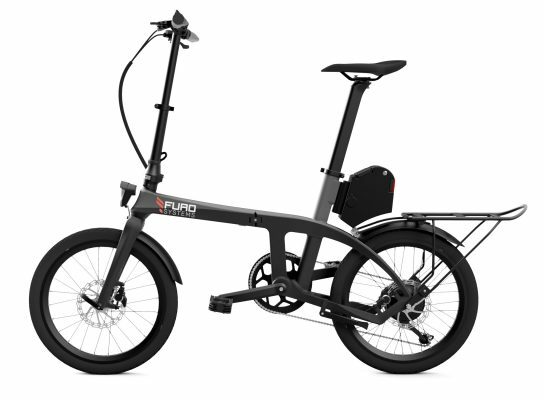 The Furo X is one of the lightest electric bicycles in the world. It merges power, range, elegance and fun with extreme practicality. We exploited the properties of carbon fiber to create an extremely lightweight, practical and beautiful folding electric bike. The Furo X's frame is engineered to be folded in seconds. It is easily transportable in both its folded and unfolded configurations. All its electronics are integrated within its frame so that riding it offers you comfort and fun with no compromise on style. It is built to the greatest standard and made for those seeking a healthier and easier lifestyle. "The FX is as powerful and versatile as it is lightweight and convenient." More press and customer reviews here. The Furo X's carbon frame is manufactured using state-of-the-art aerospace technologies to give one of the lightest electric bicycles in the world. The Furo X folds in three simple steps and weighs 15kgs fully equipped. It can fit in your bag or trunk while weighing less than a backpack. Packing more than 500W peak power, the high performance BAFANG motor takes you up city streets and steep hills effortlessly. Experience a ride akin to a glide. We assemble the Furo X's removable Lithium-ion battery from the best cells available on the market, the same ones as those used in a Tesla Model S car. The result is an incredibly compact 315Wh or 375Wh (Furo X MAX) battery. We didn't forget your phone, charge it on the go with the 5V USB output. See how fast you're going, how far you've ridden and your live battery capacity. Choose between 5 pedal assist power modes: transform your Furo X from a normal bike to a full power two-wheeler. A walk assist mode is available to get you a solid initial boost of 5-6km/h and make your high gear starts smoother! 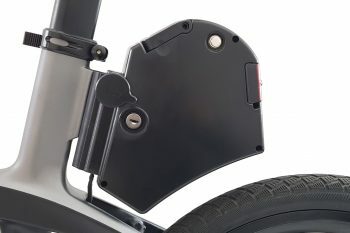 We equipped the ultimate ebike with the ultimate stopping system. Shimano Hydraulic disk brakes ensure you can always stop on a whim. The impressive power produced by the Furo X coupled to its 9 speed Shimano gear system leads to optimal comfort, speed, range and hill climbing. Start effortlessly when powered or unpowered and reach impressive top speeds! For your comfort and safety, we have added wireless turn indicators to the Furo X. Simply press the right or left arrow on the remote to let those chasing you know where your Furo X will take you next. Take your Furo X in the train, your luggage or car trunk. Never ask yourself again if you should take your ride with you. Just do it! Go to and from work without breaking a sweat, or get your dose of fitness by choosing any of the 5 power levels on your Furo X. The front and rear fenders make you weather proof. Extensive work and design was put into seamlessly integrating our electrical system into the Furo X. It retains sleek and beautiful shapes while eliminating awkward wiring and misplaced components. Get exclusive discount codes, news on our development and early-bird opportunities.